Distributed-denial-of-service (DDoS) attacks promise to remain a potent threat to the enterprise in 2015. Both IT and the boardroom need to protect mission-critical infrastructure from this growing menace to availability, brand image, and the bottom line. The key to success? Don't ignore DDoS; instead, take preventive action. 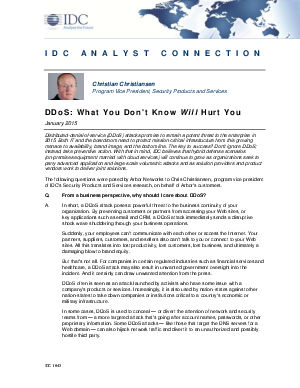 With that in mind, IDC believes that hybrid defense scenarios (on-premises equipment married with cloud services) will continue to grow as organizations seek to parry advanced application and large-scale volumetric attacks and as solution providers and product vendors work to deliver joint solutions.